Nope, this herd's not lost. 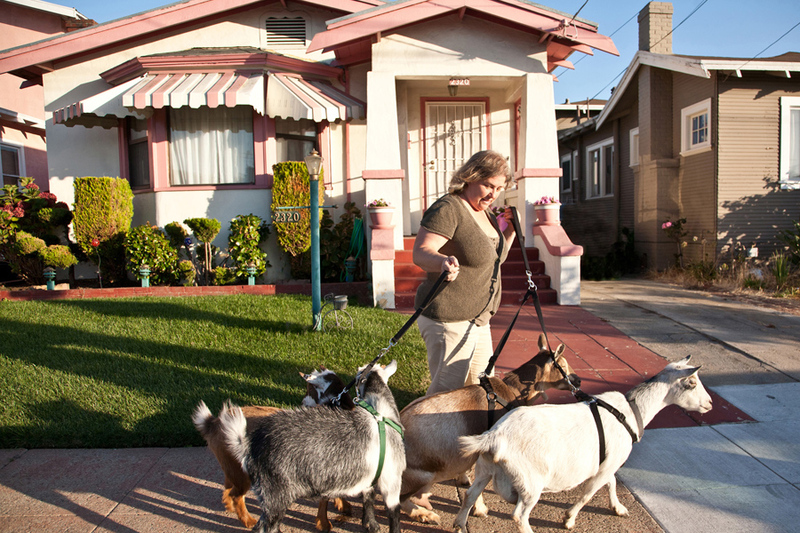 Urban farmer Kitty Sharkey often takes her four Nigerian dwarf goats for walks through her Oakland, California, neighborhood. The milk-producing goats' small size makes them well suited for life on a bustling 4,000-square-foot homestead (which includes Sharkey's 1,500-square-foot house). The breed is known for its gentle, affectionate demeanor; the goats even protect Sharkey's chickens from predators. Sharkey is part of a burgeoning movement of city dwellers who carve out a small-scale pastoral existence amid the bustle of urbanity, reaping the health and environmental benefits of hyperlocal food. Bay Area photographer (and frequent Sierra contributor) Lori Eanes documents the lives of some of these unconventional agriculturalists in her Urban Farm project. Eanes says she embarked on the project after reading about food issues: "First I read Michael Pollan's Omnivore's Dilemma and was appalled, and then I read Farm City by Novella Carpenter and was inspired. I really wanted to meet the people who were turning their yards into farms, and I wanted to learn how they did it." For Eanes, whose 15-year photography career has centered on portraits of food and people—her latest book is Backyard Roots: Lessons on Living Local From 35 Urban Farmers—chronicling urban farms seemed a natural fit. "My favorite thing about the project is the people," she says. "I'm hoping to get the word out on what they are doing." We've highlighted some of our favorite shots in this slide show.